Szijjarto pointed out that Hungary and its central European (eastern EU) neighbours were not partnering with the Russian corporation Gazprom in the Nord Stream 2 project. He said that French President Emmanuel Macron, not Hungarian Prime Minister Victor Orban, had been the main guest at the 2018 St. Petersburg International Economic Forum, and added that cooperation with Moscow wouldn't prevent Budapest from remaining a reliable ally of the United States and NATO. Pompeo visited Hungary and Slovakia as part of his tour of Europe, and is also visiting Poland, Belgium and Iceland. On Monday, he announced new US initiatives in the region, which include support to help Hungary in its fight against corruption, the strengthening of law enforcement cooperation and provision of mentorships, exchanges and training for independent media outlets in all four Visegrad countries. Sputnik discussed the US Secretary of State's visit to Europe with Scott Bennett, a political analyst and former US Army officer. Sputnik: Could you please comment on the main purpose of Mike Pompeo's trip to Europe at this point in time? Scott Bennett: I think now we are witnessing, with Venezuela, with the Syrian pullout, the pullout of troops from Iraq and Afghanistan, American foreign policy and the military policy situation, and Iran's growing confidence. We're seeing the administration of the White House, specifically the neo-cons, doubling down on an attempt to win the hearts and minds of the Europeans away from the orbit of Russian influence. This has always been a strategy of the neo-con establishment in Washington, DC: to try and expand the American Empire through military base construction as well as leveraging the IMF, UN, the EU and other international European banking cartels and bodies, and this is now the information war. So, we always have to remember: there is a military dimension of war, there's an economic dimension of war, there are diplomatic dimensions of war, and there's an informational [dimension]. 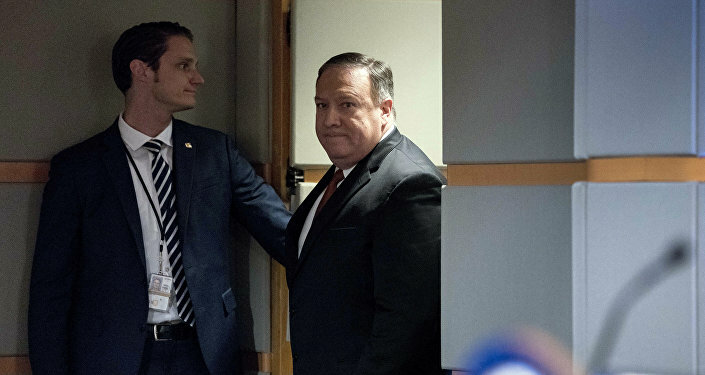 Mike Pompeo is on diplomatic war-making agenda, and is trying to shore up influence with countries in the former Soviet Union bloc. However, I think it's really going to backfire because he is demonstrating incompetence, ignorance and ineptitude; and [he is] someone who is buffoonishly ignorant in an almost sad display of inarticulate language and in an almost inebriated sense of mind. He doesn't seem to even recognise Russia today; he's stuck in a 30-years-ago, Communist red flag Cold War mentality and that is not reflective of reality. So I think that Hungary is looking at Pompeo with an almost- bizarre offence because he is going back to a time that doesn't exist anymore and he is showing what's almost contempt, in his way of looking down upon and lecturing the Hungarians, almost like they are a pawn in the US chess game against Russia. But I honestly think that's going to blow back because the American people certainly do not reflect the feelings of Mike Pompeo. If Donald Trump is not smart, he will be dragged into a very confrontational diplomatic row between these countries. They will end up then abandoning the US in favour of Russia, largely because of the US regime change operations and the endless wars that the US has been initiating. Sputnik: How important is Europe for the United States at this moment, and for the Trump administration in particular? Scott Bennett: Hungary, Poland and these other countries are vital to win because the US, the neo-cons specifically, sees these countries as leveraging and able to push back upon Russia; and, of course, they are trying to develop economic ties and economic dependency, I should say. That's one of the reasons that Pompeo, the neo-cons and the Bolton administration are trying desperately to push President Trump into this antagonistic, offensive attitude. And it also has dimensions in the Iranian de-stabilisation operations, which are upcoming. Let's not forget that they're going to have a conference in Poland to discuss Iran, to exploit the Iranian predicament and try and gear up Western nations, and NATO specifically, into a full support for a potential regime change military operation with Israel, US and NATO forces trying to politically decapitate Iran as they're trying to do to Venezuela. So I think this is an attempt to win these countries like Hungary so that they will not object to the continuing US imperial regime change ambitions which Pompeo hopes to continue over the next year. But I think we're witnessing, with President Orban, a very clear, firm and uncompromising proclamation that Hungary, among many other nations, will not stand for that sort of a thing. They will not stand to be used, they will not stand to be lectured to or in any way treated like a child at a table with the US being the professorial voice of authority, when in actual reality it has the moral authority based on its previous immoral actions in Venezuela, Syria, Libya and elsewhere. Sputnik: How particularly will the suspension of the INF by the US and subsequently by Russia change the significance of US-Europe relations? Has this really stepped up this sort of race to gain favour with these European countries between the US and Russia? Scott Bennett: It's something really to behold, because when you witness what's going on in Europe right now, it's a tinder box. Europe is falling apart precisely because of the US regime change operations and the destabilisation of the Middle East. George W. Bush started that under the 9/11 wars, which were subsequently disproven as a complete false flag event; it was used as a license for this economic military juggernaut. Obama continued them and expanded them to Libya and Syria and Ukraine with the ambition of continuing up against Russia after Syria fell. And Donald Trump came in office because the American people said ‘no more'; they did not want war with Russia, and Donald Trump said all the right words. He said "wouldn't it be nice to normalise relations with Russia?" and Vladimir Putin said the same thing. So, it was something to behold that there may be a chance that we would have corrected the mistakes that were made back in the 1990s, and the American people want that. So when Donald Trump entered the political landscape, he seemed to have sort of dropped that ball, or waivered or been inclined and pushed or manipulated into continuing this neo-con legacy.